Ever considered a day at the races or two for a big pre-wedding blowout? It could be a classy way to celebrate your nuptials with the boys before the big day! Racecourses are becoming more and more about an all-round experience with the sporting action lying at its heart. Whether it’s a champagne bar or a pint, a decent meal or something less formal, there are hospitality packages to suit you at many leading UK venues. Going to just any old horse racing meeting isn’t special though, so here are five in Britain between March and August to consider for a stag do. If jumps racing appeals to you, then it doesn’t come any bigger than the four-day Cheltenham Festival, traditionally held during the second week of March. The very best National Hunt horses are on show at the Prestbury Park course in the Cotswolds within easy reach of Bath, Bristol, Gloucester, South Wales and the West Midlands. A spring wedding works best with Cheltenham horse racing and there are championship events aplenty across the Festival. From Champion Hurdle day on the Tuesday, through Ladies’ Day and the Champion Chase, and the Cheltenham Gold Cup on the Friday, there’s plenty of chances to take a punt. From the southwest to the northwest now. How would being at Aintree for the world’s most famous steeplechase sound for your stag do? The Grand National with its 40 runners and 30 fences over a marathon four-and-a-quarter miles is watched and bet on all over the planet! Depending on when Easter falls, this three-day jumps horse racing meeting can be in the first or second week of April. As Aintree racecourse is just a stone’s throw away from Liverpool and easily reachable from Greater Manchester, Cheshire, North Wales and West Yorkshire, it covers a wide catchment area too. The middle of June sees the absolute best of the Flat horse racing in Britain. Royal Ascot is an institution of the sport. Established by Queen Anne, it attracts entries from all over the world and is a short train journey from London terminuses. 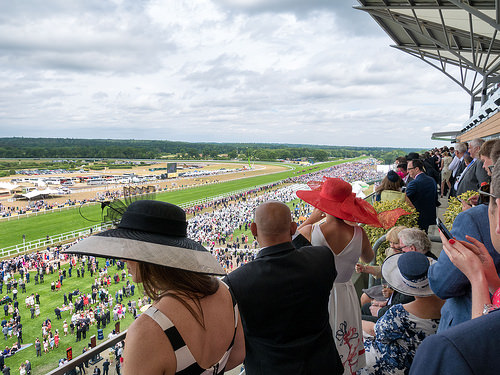 Whether a Flat stayers’ race or a five-furlong sprint takes your fancy, there’s something for everyone across the five days of Royal Ascot with Group 1 races galore. Given how well-connected the Southeast is in general, it’s a doddle to get to. Just remember, you will need to dress to impress depending upon which enclosure you have tickets for! Another racecourse that’s steeped in history is Newmarket. Just over the Suffolk border from Cambridge, it is known as the headquarters of Flat horse racing. The July Festival there over three days in mid-July contains one of the most valuable sprint races in the world – the July Cup. If you’re from East Anglia or the East Midlands, then Newmarket – which also hosts Guineas weekend at the start of May and a host of other high-profile meetings – is well worth a look for a stag do ahead of a summer wedding. York is a very popular destination for hen dos, but that doesn’t mean the boys can’t have a cracking time in the capital of the north. The Ebor Festival, held over four days leading up to and on the August Bank Holiday Weekend are absolutely stellar. Away from big races like the Ebor Handicap, Great Voltigeur, Lonsdale Cup and Nunthorpe Stakes, York city centre is within easy walking distance of the Knavesmire racecourse. Head inside the famous city walls to find pubs and bars aplenty.